The goal of the GATE project is to advance the state-of-the-art in game design and game technology and to build a strong knowledge base. Besides the academic research, GATE is also geared towards developing this knowledge further into practical solutions. The mechanism to make that happen is through Knowledge Transfer Projects. The following scheme indicates the flow of knowledge we envision within GATE. Companies provide knowledge questions and intended applications. The research partners provide new technology. The knowledge transfer projects combine these into practical solutions but also pose new research challenges to the research partners. In turn this will help to focus the research on the mid- and long-term needs from industry. There are many SME (Small and Medium size Enterprises) companies involved in game and simulation development in the Netherlands. For example, there are a number of companies which create simulation environments for training (driving simulators, safety training, and urban planning). Also there are many game developers focusing on entertainment or serious games in a number of contexts. And there are companies that provide technology and tools used in game development. A large number of new companies are being founded at the moment in the Netherlands. A major challenge for these companies is that technology in the domain of games and simulation is developing at an extremely fast pace. New simulations and games must use this technology to be competitive with products from competitors. However, various factors limit the innovative drive of SME's. SME's generally do not have the time to scout new technologies worldwide and to integrate these technologies in their products. An additional complication is that the field of gaming and simulation is very multi-disciplinary and strongly involves scientific α-, β- and γ- disciplines. The GATE project will create the knowledge base in the Netherlands that can give these companies a leading edge by helping SME's to integrate new technology into their products. Discussion with many SME companies in the domain has indicated that the most effective mechanism for this is to create joint development teams consisting of developers from the companies and researchers from the knowledge institutes, which collaborate on making a clearly defined body of knowledge directly accessible to industry. Such joint development teams will create a close working relationship between industry and academia and will guarantee that the results are indeed applicable. Also, the joint teams will ensure that the transferred knowledge will become embedded in the companies. A substantial part of the GATE project is devoted to such knowledge transfer projects. A typical knowledge transfer project will have a budget of around 200,000 Euros of which half is provided by the GATE project. We envision funding around 15 such projects. A project will typically run for 2 years, although shorter and longer projects are also possible. Information about the research themes can be found on the GATE website. Projects will be carried our jointly by the companies and the researchers involved in the research themes. A knowledge transfer project will take the form of a collaboration between a company and one of the research partners in GATE (Utrecht University, Twente University, Delft University of Technology, or TNO). Half of the budget is provided by the company and half by the knowledge institute through the GATE project. A short proposal must be written about the intended project. The research partners involved are responsible for the submission of such a proposal. The GATE steering committee decides which projects will be approved. 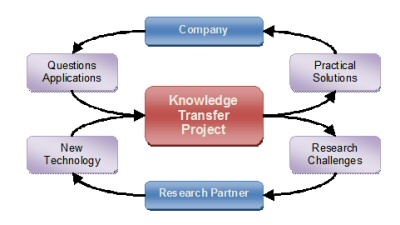 Those companies interested in a knowledge transfer project can best contact the leaders of the different research work packages in GATE as can be found on the website. Alternatively, they can contact the GATE management (see below). Further information about the precise conditions, IPR regulations, and the required content of a proposal can be obtained from the GATE secretary.